KAESERFilter &Activated Carbon Adsorbers Reliable and profitable, pure compressed air. Kaesercompressed air filters and Activated Carbon Adsorber provide your systems and processes reliable, highly efficient protection against dust, aerosols, and oil vapors – for all purity classes as per ISO 8573-1, perfectly compatible with our range of compressors and other compressed air treatment options. Kaeser compressed air filters are available with a pressure of 16bar, whilst high-pressure filters range up to 45bar; filters are also available in silicon-free versions, such as for use in painting processes. 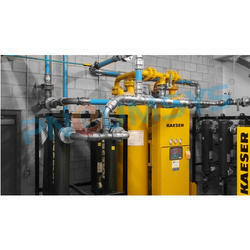 Kaeser High Pressure Compressed Air Filter take advantage of high-pressure filtration – from pre-filters to activated carbon filter. Kaeser High Pressure Compressed Air Filter remove dust, oil aerosols, vapors and odors at working pressure up to 45 bar thereby supplying compressed air to all purity classes as per ISO 8573-1. They are ideal companions to our Kaeser Air Compressor and booster stations, where they are used for producing the blower air used in production products like PET bottle. The filter housing is made of 1.4301 stainless steel, making it corrosion-resistant for maximum particle purity. High-pressure coalescence filters are available equipped with the ECO-DRAIN electronic condensate drain. A manual tap drain is offered for particle and activated carbon filters. Five different filter grades are available for working pressures up to 45 bar – from pre-filters to activated carbon filters. This ensures application-appropriate filtration for all purity classes as per ISO 8573-1 – with minimal pressure loss. 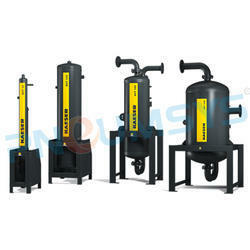 Kaeser Activated Carbon Adsorber -series activated carbon filters reliably remove oil vapors and odors. Installed downstream of compressed air drying and pre-filtration components, they attain Class 1 residual oil content as per ISO 8573-1, thereby protecting production processes sensitive operations. High-quality activated carbon and their enduring low pressure loss make them a highly cost-effective choice: they can last 12,000 hours of compressor operation without replacement of the activated carbon. Kaeser ACT absorbers have very long replacement intervals thanks to their generous dimensions and optimal flow dynamics through the highly effective activated carbon. They're also mounted in a protective and durable steel frame. 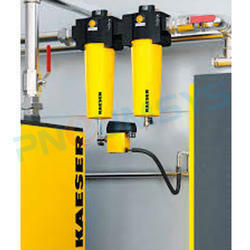 Kaeser Compressed Air Filter is the key component for producing compressed air to all purity classes as per ISO 8573-1. All with exceptionally low differential pressure and enables quick and clean element changes. Moreover, their service-friendly design not only allows simple, error-free opening and closing of the filter housing. Compressed air filter, often referred to as line filters, are used to remove the contaminant from the compressed air after compression has taken place. When the filer is combined with a regulator and an Oiler, it is called an air set. Air leaving a standard screw or piston compressor will generally have a high water content, as well as a high concentration of oil and other contaminants. There are many different types of filters, suitable for different pneumatics application.